This photo released Tuesday, Feb. 12, 2019, by the Las Vegas Metropolitan Police Department shows a package thief who made off Thursday, Feb. 7, with a delivery box containing what a mother reported was $40,000 worth of cancer treatment drugs for her 14-year-old son. 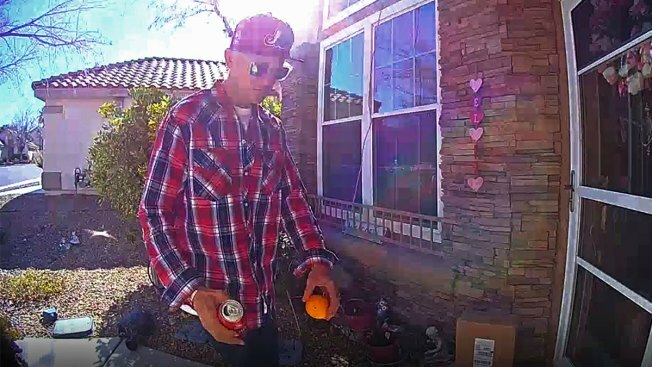 The photo from doorbell security video shows a man wearing sunglasses, a red plaid shirt and a red baseball cap before he took two packages and walked away on Thursday. A thief in Las Vegas made off with a delivery package containing what a mother told police was $40,000 worth of cancer treatment drugs for her 14-year-old son, authorities said Tuesday. "You're not just taking pants or a shirt, you're taking something that's keeping someone alive," she said. Shavinsky called 911 and filed a police report, Meltzer said, but an immediate search of the neighborhood by a detective did not find the thief.